”The longtail boat drops you at reception at the pier infront of the resort and instantly you know you have found a very special part of the world”. The views from the resort are world class looking out onto to Phi Phi Ley island, the cliffs at Tonsai and crystal clear and gleaming sea on a sandy beach. 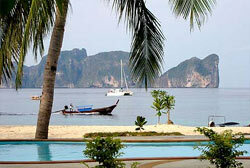 The resort faces the warm water and cool breeze of the Andaman Sea. This creates a relaxed and secluded atmosphere.The Resort is a series of low density bungalow cottages on the side of a gently sloping hill over looking the reception, pool and beach. The wooden balcony rooms are on stilts among the tree canopy. The interior design is by far the best seen on Long Beach and rooms boast all the soaps and towels needed for comfort. The atmosphere is young and trendy 25-50 year olds, the style is rustic beach tropical with comfort. 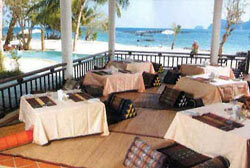 This resort is one of the best in the Tonsai Village - Long Beach areas. The tranquil Thai style restaurant offers an extensive range of Thai and western dishes it's also an ideal place to relax and have a drink in the sunset cocktail bar. There are simple massage mats laid out near the beach along the beach (but not part of the hotel). Prices range from 300-350THB. Long Beach Divers is just 50 meters from reception and there are about 20 dive centers at Tonsai Village which is just 12 minutes by longtail boat. Snorkeling off the reef in front of the Phi Phi The beach Resort is some of the best on Phi Phi island. The Rocks in front of the resort are home to a wide range of corals and fish. This is an ideal resort for those who enjoy beach life. The hillside bungalows offer the most beautiful views of the ocean and the islands. Each room has a private balcony and pathways leading to the resturant and the pool. 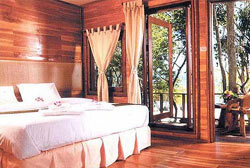 The air conditioned rooms have hot and cold water, satellite TV, Minibar and telephone.